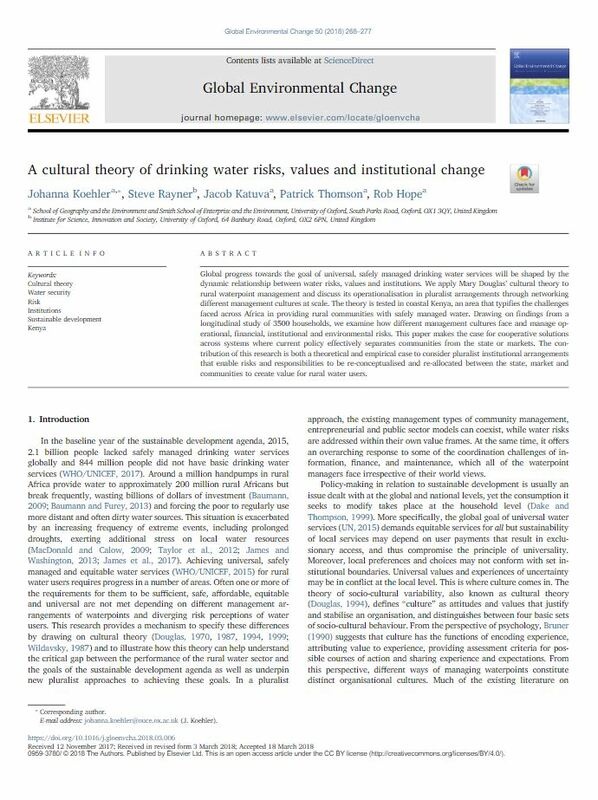 Global progress towards the goal of universal, safely managed drinking water services will be shaped by the dynamic relationship between water risks, values and institutions. We apply Mary Douglas’ cultural theory to rural waterpoint management and discuss its operationalisation in pluralist arrangements through networking different management cultures at scale. The theory is tested in coastal Kenya, an area that typifies the challenges faced across Africa in providing rural communities with safely managed water. Drawing on findings from a longitudinal study of 3500 households, we examine how different management cultures face and manage operational, financial, institutional and environmental risks. This paper makes the case for cooperative solutions across systems where current policy effectively separates communities from the state or markets. The contribution of this research is both a theoretical and empirical case to consider pluralist institutional arrangements that enable risks and responsibilities to be re-conceptualised and re-allocated between the state, market and communities to create value for rural water users. This article was published in Global Environmental Change. You can access the open access version of the article by clicking on the button below.